This book examines the development of big business in Russia since the onset of market oriented reform in the early 1990s. It explains how privatized post-Soviet enterprises, many of which made little sense as business units, were transformed into functional firms able to operate in the environment of a market economy. It provides detailed case studies of three key companies – Yukos Oil Company, Siberian (Russian) Aluminium and Norilsk Nickel – all of which played a key role in Russia’s economic recovery after 1998, describing how these companies were created, run and have developed. It shows how Russian businesses during the 1990s routinely relied on practices not entirely compatible with formal rules, in particular in the area of corporate governance. The book fully explores the critical role played by informal corporate governance practices - such as share dilution, transfer pricing, asset stripping, limiting shareholders access to votes, and 'bankruptcy to order’ - as Russian big business developed during the 1990s. 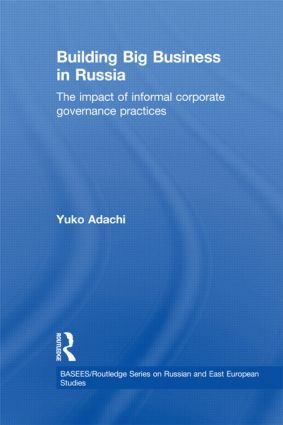 Unlike other studies on Russian corporate governance, this book highlights the ambiguous impact of informal corporate governance practices on the companies involved as commercial entities, and suggests that although their use proved costly to Russia’s business reputation, they helped core groups of owners/managers at the time to establish coherent business firms. Overall, the book shows that we cannot understand the nature of current economic changes in Russia without recognising the crucial role played by informal corporate governance practices in the creation and development of big business in post-Soviet Russia. Yuko Adachi is Associate Professor in the Department of Russian Studies, Sophia University, Japan.